Calf pain can vary from mild numbness and tingling to excruciating pain that impairs your ability to walk. This discomfort can be felt anywhere between the knee and the ankle along the backside of the lower leg. Here you will find the gastrocnemius and soleus muscles as well as tendons, blood vessels, and ligaments. Calf muscle pain is commonly known as a “Charley Horse” episode when there is no trauma involved, but calf pain can be caused by damage to the nerves or direct injury to the lower leg. Calf muscle strain can also be felt as a burning sensation or as a prickling feeling, called paresthesia. Serious health conditions such as deep vein thrombosis can present this form of pain, and, left untreated, can lead to a stroke or heart attack. We will look at the various causes and possible home remedies for calf muscle pain for you to try in the privacy of your own home. The calf of the leg holds blood vessels, nerves, tendons, ligaments, and muscles, which all can lead to calf pain as a result of trauma or damage. There are two major muscles essential to the movement of the leg—the gastrocnemius muscle and the soleus muscle. The gastrocnemius muscle is the large, diamond-shaped bulging muscle on the back of the lower leg. It bypasses the fibula and tibia shin bones and is attached to the femur bone and calcaneus, or heel bone with the help of the Achilles tendon. The soleus muscle is flat and small and lies behind the gastrocnemius muscle. This muscle connects with the shin muscles of fibula and tibia, as well as to the calcaneus via the Achilles tendon. Another conjoining muscle is the plantaris, which connects at the lower end of the fibula to the Achilles tendon and into the calcaneus. Calf muscle pain is categorized into three grades or levels according to the severity of the damage or injury. Grade II: Medium-sized tearing or stretching of the muscle fibers. Limping may be visible, along with possible bruising, as pain increases and strength decreases. Grade III: Severe damage or complete tearing of the muscle. Movement is impaired, and bruising and swelling are The skin surface may be inverted over the calf, and extreme pain increases when weight is placed on the leg. Pain in the calf muscle is a common result of straining the medial gastrocnemius muscle during physical activity such as with sports. This type of strain is often called tennis leg, originating from a 1883 reported case of a tennis injury. Pain, bruising, and swelling along the back of the leg can be felt and seen, lasting for months and sometimes years. Injury to this small muscle often occurs with jumping or running activities where the weight is placed on the ankle when the leg is extended. Muscle pain can range from mild to moderate with severe pain and swelling within the subsequent 48 hours. Damage or injury to the Achilles tendon can be a tear, irritation, or an overstretch caused by excessive use, weak calf muscles, arthritis, or the aging process. Calf pain symptoms may include soreness above the heel in the back of the leg, stiffness, tenderness, and severe pain, especially after climbing stairs or running. Also known as a popliteal cyst, it is a bulging fluid-filled lump that develops behind the knee. It causes increased calf pain with activity and knee movement. The cyst can be the result of a tear in the cartilage or arthritis. A direct hit to the calf can compress the muscle onto the bone, resulting in bruising. Immediate pain is felt and may range from a pinching sensation to severe, along with tenderness and soreness. This condition is common in contact sports like soccer, and the trauma may cause sudden temporary loss of use of the leg. Leg cramps occur when the calf muscles contract and spasm involuntarily. The sufferer will usually experience calf pains at night. Tightness and pain can range from mild to severe, and can last a few seconds or several minutes. This form of calf pain may happen for unknown reasons or due to excessive exercise, pregnancy, medications, or liver disease. Rhabdomyolysis refers to damaged muscle fibers collapsing because of an injury to the muscle. These fibers then enter the blood system, possibly causing kidney failure. Calf pain, swelling, and muscle weakness can result from automobile accidents, poisoning, immobility over time, severe burns, excessive use of recreational drugs, medications, and infections and diseases. This type of fracture is a tiny crack in the fibula bone. It occurs from excessive traction and twisting of the lower leg. It frequently happens in athletes who perform with their foot rolling inwards while running. Tenderness and pain in the calf increase with exercise and when placing weight on the affected leg. The posterior compartment of the lower leg contains the popliteus muscle, the flexor hallucis longus muscle, the flexor digitorum longus muscle, and the tibialis posterior muscle. When one of these muscles expand beyond the protective sheath, pain can be felt throughout the lower leg when used. Overuse of the muscles and injury can create an environment of swelling and bleeding within the muscle compartment. Any of the lower leg muscles can tighten and cause severe calf pain that may increase with use. This can happen gradually with improper stretching before strenuous activity or by an injury such as a compartment syndrome. Damage to the muscle can include small tears that cause muscle spasms wherein the contracting action of the muscle inhibits proper blood flow. This condition is characterized by leg pain, weakness, and numbness due to an injury or damage to the sciatic nerve that runs from the lower back down through the legs. Sciatica is a symptom of a lower back issue such as spinal stenosis, a lumbar herniated disc, spondylolisthesis, or a degenerative disc disease. Calf pain can be accompanied by a burning sensation, tingling, weakness, and difficulty moving the leg and foot. The lateral compartment of the lower leg contains the peroneus longus, also known as the fibularis longus and the peroneus brevis, which allows us to turn the foot outward. If these muscles swell beyond their protective sheath or covering, calf pain will ensue. Pain can be sudden from an injury, or gradual caused by the muscle growing over time as is seen in runners. The outer portion of the calf may swell and be tender. The nerves can become damaged by high blood sugar or glucose levels, inflammation, injury, and by external sources such as with alcohol and tobacco use. There is often a pain in the lower legs such as in the calves, as well as numbness and tingling sensations. Commonly known as RA, this condition sees inflammation and swelling of the joints resulting in pain, stiffness, and tenderness. Calf pain may be felt upon movement after extended rest periods, especially first thing in the morning. The causes of rheumatoid arthritis have yet to be confirmed as it is considered an autoimmune disease where immune system attacks healthy tissues of the body. The blood travelling from the tissues to the heart can collect and cause swelling. As a result, the weakened or damaged valves within the veins appear as what are known as varicose veins. Pain, swelling, and cramping of the muscles can occur within the calves. Varicose veins are often the result of a sedentary lifestyle, trauma, obesity, and genetics. This condition may lead to blood clots and skin ulcers. A blood clot may form within the veins, which impairs blood flow resulting in calf pain and swelling. This usually occurs after a surgical procedure where the patient is unable to move for a prolonged time. Referred to as DVT, this is when the blood thickens and pools together to form a blood clot deep within a vein. It is caused by injury, infection, inflammation, or as a result of surgery. A blood clot in the lower leg can cause the calf to swell, be warm to the touch, and present pain, especially when placing weight on it. In rare cases, a lower leg blood clot can travel to the lungs and hinder blood flow, known as pulmonary embolism. This common condition can occur in the legs when narrowing arteries restrict blood flow. There can be a pain in legs when walking known as claudication. Also, body tissue death can result with improper blood flow. 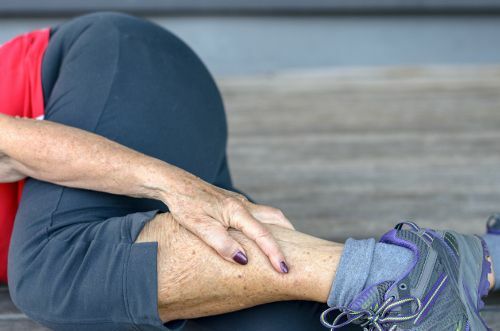 Numbness, cramping, and calf pain worsens with activity, but can also be severe when the body is at rest with the progression of the disease. A calf pain diagnosis entails a complete medical history analysis as well as a physical examination for bruises or swelling. The doctor will evaluate your gait and stance with walking and weight bearing exercises. What sort of activity were you doing at the time when the pain started? Did you suffer an injury from a direct blow at the time? Was there a popping or cracking sound when the pain began? Did the leg swell within the first two or three hours? Is it painful when you walk, stand, or bend the knee or ankle? The doctor will determine whether the underlying cause of the calf pain was the result of an injury or health condition to properly treat it. Serious medical conditions may require prescribed anti-inflammatories, corticosteroids, and antibiotics, as well as chemotherapy, radiation therapy, physical therapy, or possibly surgery. The goal of these calf strain treatment options and the following natural remedies is to reduce the pain while improving the mobility, strength, and flexibility of the calf muscles, ligaments, and tendons. Resting the calf muscles can alleviate the pain, reduce any swelling, and speed up the recovery time whether it is a mild or major calf issue. Use crutches when walking is required to avoid placing weight on the affected leg. Apply a cold or ice compress to the affected calf to treat the inflammation, pain, and swelling. Once the swelling has gone down, apply heat compresses to the calf to continue pain management. If you apply the heat too soon, it can cause the pain and swelling to increase. Use a compression sleeve or bandage around the affected calf for a 10-minute treatment several times each day. Doing this will reduce blood flow to the damaged tissues and allow proper healing. Place heel pads in both shoes to alleviate any strain on the calf muscle while walking. The pads will raise the heel while shortening the length of the muscle. Perform stretching exercises to strengthen and lengthen the tendons and muscles of the calves. Repeat these exercises four or five times daily. With your knee bent, move the foot up and down 10 times, flexing at the ankle. Once the pain lessens, do the same exercises with leg straight. Move the foot in a large circular motion 10 times both clockwise and counterclockwise. Position the affected leg in front of the other and slightly lean forward with the knee of the affected leg slightly hovering over the foot. Keep both feet flat on the floor for 15 seconds as you feel a stretch in the calf. Facing a wall, lean forward with your hands on the wall for support. Place the leg with the injured calf behind the foot of other leg and hold the stretch for 15 seconds. Place your hands on a table or counter with your feet apart and raise your heels up so that you are standing on your toes. Do this several times. These exercises will help the calf maintain motion and strength during the healing process. Avoid rushing to return to strenuous activity as full healing may take several weeks. You can also participate in walking, swimming, and cycling workouts to help strengthen the calf. Calf pain is a common symptom often causing problems with walking, running, and in some cases, even standing upright. The calf muscles are located in the posterior of the lower legs, allowing us to move as they pull the heel in an upward motion. Pain in the calf muscle can be the result of an injury, trauma, or as a consequence of an underlying health condition. But in most cases, you can treat muscle strain with rest and home remedies. “Calf Pain,” Healthgrades, September 26, 2016; https://www.healthgrades.com/symptoms/calf-pain, last accessed August 14, 2017. “Calf Muscle,” WebMD, March 13, 2017; http://www.webmd.com/fitness-exercise/picture-of-the-calf-muscle#1, last accessed August 14, 2017. Fitzgordon, J., “Anatomy Of The Calf Muscle,” CoreWalking; https://corewalking.com/anatomy-of-the-calf-muscle/, last accessed August 14, 2017. Cluett, J., “7 Common Causes Of Calf Pain and How To Treat Them,” Verywell, August 16, 2017; https://www.verywell.com/causes-of-calf-pain-and-treatment-options-2549387, last accessed August 16, 2017. Avruskin, A., “Physical Therapist’s Guide to Calf Strain,” Move Forward; http://www.moveforwardpt.com/symptomsconditionsdetail.aspx?cid=f52d166b-3906-4003-8cd4-64ea162724b0, last accessed August 14, 2017. Cluett, J., “Calf Strain – Muscle Spasm of the Leg,” Verywell, July 14, 2017; https://www.verywell.com/calf-strain-muscle-spasm-of-the-leg-2549855, last accessed August 14, 2017. Dixon, B.J., “Gastrocnemius vs. soleus strain: how to differentiate and deal with calf injuries”, Current Reviews in Musculoskeletal Medicine, May 23, 2009; 2(2): 74-77. DOI: 10.1007/s12178-009-9045-8, last accessed August 14, 2017. Spina, A.A., “The plantaris muscle: anatomy, injury, imaging, and treatment,” The Journal of the Canadian Chiropractic Association, July-September 2007; 51(3): 158-165. https://www.ncbi.nlm.nih.gov/pmc/articles/PMC1978447/, last accessed August 14, 2017. “Achilles Tendinitis,” National Center for Biotechnology Information; https://www.ncbi.nlm.nih.gov/pubmedhealth/PMHT0024961/, last accessed August 14, 2017. “Achilles Tendinitis,” Mayo Clinic, August 4, 2015; http://www.mayoclinic.org/diseases-conditions/achilles-tendinitis/basics/definition/con-20024518, last accessed August 14, 2017. “Baker’s Cysts,” Mayo Clinic, June 12, 2015; http://www.mayoclinic.org/diseases-conditions/bakers-cyst/basics/definition/con-20023332, last accessed August 14, 2017. Whitlock, J., “Blood Clots During And After Surgery,” Verywell, August 29, 2016; https://www.verywell.com/blood-clots-during-and-after-surgery-3156814, last accessed August 14, 2017. “Leg cramps,” NHS Choices, November 9, 2014; http://www.nhs.uk/Conditions/legcrampsunknowncause/Pages/Introduction.aspx, last accessed August 14, 2017. “Rhabdomyolysis,” WebMD, October 27, 2016; http://www.webmd.com/a-to-z-guides/rhabdomyolysis-symptoms-causes-treatments#1, last accessed August 14, 2017. “Lateral Compartment Syndrome,” Sports Injury Clinic; http://www.sportsinjuryclinic.net/sport-injuries/ankle-achilles-shin-pain/lateral-compartment-syndrome, last accessed August 14, 2017. “Contusion Of the Lower Leg,” Sports Injury Clinic; http://www.sportsinjuryclinic.net/sport-injuries/ankle-achilles-shin-pain/contusion-lower-leg, last accessed August 14, 2017. “Fibula Stress Fracture,” Sports Injury Clinic; http://www.sportsinjuryclinic.net/sport-injuries/ankle-achilles-shin-pain/fibua-stress-fracture, last accessed August 14, 2017. “Explore Deep Vein Thrombosis,” National Institutes of Health, October 28, 2011; https://www.nhlbi.nih.gov/health/health-topics/topics/dvt/, last accessed August 14, 2017. “Posterior Compartment Syndrome,” Sports Injury Clinic; http://www.sportsinjuryclinic.net/sport-injuries/ankle-achilles-shin-pain/posterior-deep-compartment-syndrome, last accessed August 14, 2017. “Tight Calf Muscles,” Sports Injury Clinic; http://www.sportsinjuryclinic.net/sport-injuries/ankle-achilles-shin-pain/tight-calf-muscles, last accessed August 14, 2017. “Diabetic Neuropathies: The Nerve Damage of Diabetes,” National Institutes of Health, February 2009; www.niddk.nih.gov/-/media/A710C2B4CC214818B8C0BC7A30C8F7E8.ashx, last accessed August 14, 2017. “Rheumatoid Arthritis,” MedlinePlus, January 16, 2016; https://medlineplus.gov/ency/article/000431.htm, last accessed August 14, 2017. “Explore Varicose Veins,” National Institutes Of Health, February 13, 2014; https://www.nhlbi.nih.gov/health/health-topics/topics/vv, last accessed August 14, 2017. “Peripheral Artery Disease,” Mayo Clinic, August 12, 2017; http://www.mayoclinic.org/diseases-conditions/peripheral-artery-disease/symptoms-causes/dxc-20167421, last accessed August 14, 2017. “Sciatica in the Calf Tortures,” The Sciatica Authority; http://www.sciatica-pain.org/sciatica-in-the-calf.html, last accessed August 14, 2017.